Participating locations in US and Mexico. Offer ends 8/31/14. Participating locations and limited time only. See site for details. Pay now and save up to 30% on your rental. Participating locations only. Limited time offer. Applies in CA, FL, NV, and HI. Save up to $20 on weekly & weekend rentals. If you’re in need of a touring car, Hertz rents every manner of automobile, sedan, luxury vehicle, wagon, estate car, SUV, minivan, convertible, or commercial van and truck that exists. Book your rental from the comfort of your home or on-the-go at a Hertz Self Service Kiosk. With over 8,000 locations in 145 different countries, you’ll find plenty of ways to use these Hertz coupon codes. If you would like to rent a ride, pick up your motor vehicles at any Hertz location. Since there are over 8,000 Hertz rental offices and self-service kiosks in at least 145 different countries, Hertz will be there. One of the most established rental agencies in the world there are plenty of reasons to choose Hertz. From Hertz Local Edition Free Pick Up & Return Service, to Hertz Mobile, SiriusXM Satellite Radio, and Hertz 24/7 Emergency Roadside Assistance. You can reserve the exact car you want, be it from their Hertz Prestige Collection, Porsche® Rentals from Hertz, Hertz Adrenaline Collection, or Hertz Green Traveler Collection. Do you need to rent a car for longer than a few days? Inquire about Monthly Car Rentals by Hertz. As an alternative to pushy salespeople, Hertz also sells used cars from their fleet. Their Hertz Rent2Buy® program lets you test out the vehicle for three whole days before you make a decision. Frequent renters should really take advantage of Hertz Gold Plus Rewards, because you’ll earn loyalty points with every dollar spent. These points can be applied toward more rental vehicles, or even Hertz’ many air, rail, hotel, and travel partners. The company traces it’s roots back to 1918, when Walter L. Jacobs opened a car rental service with one dozen Model-T Fords. He was in his early twenties at the time. In 1923, Walters sold his company to John D. Hertz, owner of Omnibus Corporation, who renamed the service the Hertz Drive-Urself. Over it's long history as a publicly traded company, Hertz has changed hands half a dozen times. From the Fifties up into the Eighties, it went from General Motors to RCA, Ford Motor Company, and Volvo. Then in the 2000's there were a host of private equity companies like the Carlyle Group, Clayton, Dubilier & Rice, and Merrill Lynch Global Private Equity. Hertz Corporation was voted the #1 US Car Rental service Rated Overall by Zagat 2013/2014. The won the 2013 Women's Choice Award for Car Rental Services for Best Green Option, Best Business Travel, Best Loyalty Programs, and Best Overall Customer Service. The company has made a commitment to the environment through their Hertz Living Journey Sustainability program. So when you want to hire a hatchback, contract a compact, or take out a town car, Hertz is the place to go. The award-winning combination of good customer service and convenient rental cars has driven Hertz since 1913. Test drive one of these Hertz promo codes. New to car rental? There are a lot of different services to consider from Hertz, such as short-term and long-term car rental, Hertz Gold Plus Rewards, commercial vehicles, and used car sales. Some of the most frequently asked questions at Hertz have to do with online check in and the loyalty program. When you check in online, you can pick up the rental car at a self serve kiosk, instead of waiting in line to talk to a customer service representative. Even if it is a small office in an out of the way location where there is no kiosk, there will still be a lot less paperwork. You can check in online as soon as you book the rental car. There is no need to wait until 24 hours before the reservation. How do I pick up the car after checking in online? At the Hertz location where you obtain the vehicle, there will be a Self-Service Express kiosk. Some exclusions apply. You will need your Drivers License, contact information, date of birth, and passport if applicable. Does the travel agent check in for me? Online check in is generally available, even if you are part of a tour program. Consult with your travel agent or prepaid program provider. 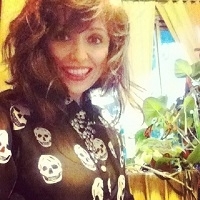 Can anyone use online check in? There are a few restrictions. Drivers under the age of 21 are not eligible to check in online. Other exceptions include Applicant Program #1 Club members, first time #1 Club Gold customers, rentals included in the Guarantee Program, Special Requests, or rentals booked using a the Hertz Bereavement CD number. Is there self check in at every Hertz location? Hertz.com proclaims that there is self check in at every one of their locations in the U.S., Canada, Puerto Rico, and St. Thomas. Do Hertz Gold Rewards members have to check in? No! That’s one of the benefits of joining the program. You just go straight to your car after you arrive. There is no fee to sign up for membership in Hertz Gold Plus Rewards. You can earn points in most of the countries in North America and Western Europe. 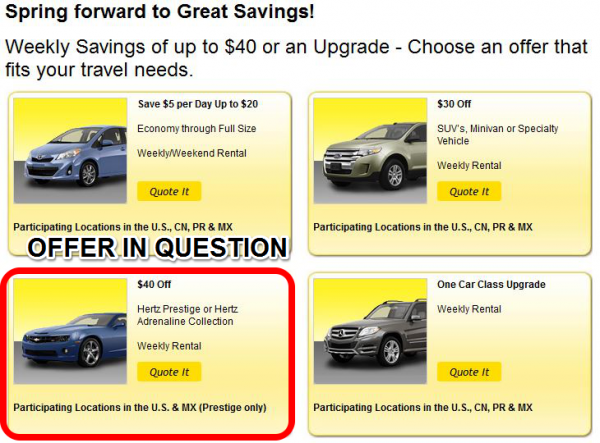 Redeem loyalty points online at Hertz or one of their many travel partners. And, select the reward that’s right for you! Where do I check my point balance? Check your point balance by logging into your Hertz account online. The Rewards Account Activity link contains more detailed information. Can I get credit for past rentals? If the rental occurred in the past six months, and you were not informed of the program, even though you qualified, then they will credit you loyalty points. As long as there was activity on your account in the past 24 months, the Gold Plus Rewards points do not expire. 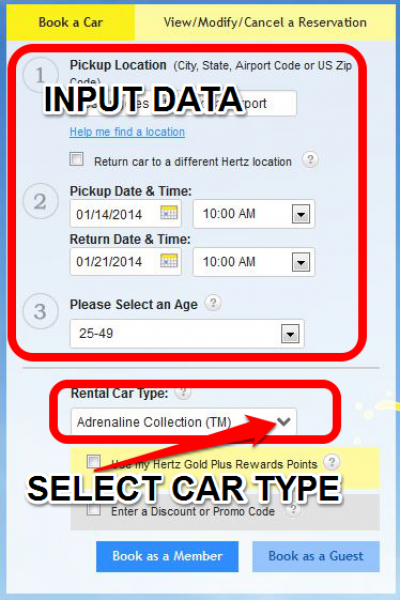 For most of the Hertz coupon codes to work their best, you should be logged into your Hertz account. If you have never rented an automobile at Hertz, then you should register for an account in order to get the best possible deal. You will need a valid driver’s license and a debit or credit card. Then you are eligible to pay your bill online, as opposed to in person when you pick up the vehicle. Here’s how you get started. Step 1) Find a coupon code. Renting a car for a few days adds up to a significant chunk of change. It is always a good idea to check for additional discounts when booking travel. Assuming you are not in an incredible hurry. This coupon for $40 off a weekly rental in the Adrenaline or Prestige Collection looks interesting. Step 2) Navigate to Hertz website. After I click on the Hertz promo code to activate the deal, I head over to Hertz.com to look for a rental that qualifies for the discount. Step 3) Search for a car. This coupon is for cars in the the Adrenaline or Prestige Collection. Let’s look at the Adrenaline Collection, which features America’s favorite muscle cars. Step 4) Select a vehicle. 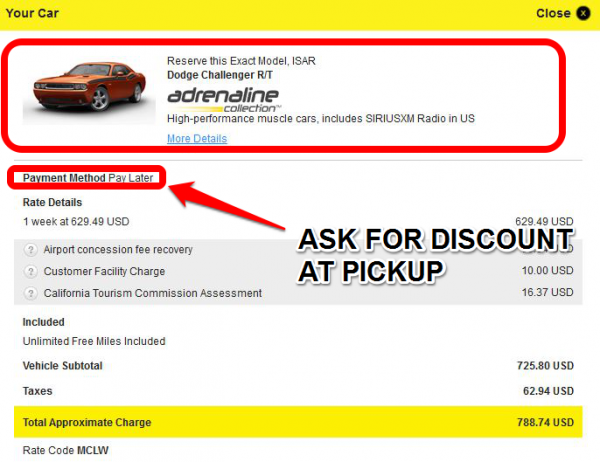 If I rent this Dodge Challenger R/T ISAR for a week in LA, it should qualify for the $40 discount. Step 5) Apply discount at checkout. In this example, I am reserving the car as a guest. So, after entering my credit card information, and confirming the reservation online, I will have to pay later, when I pick up the Challenger. At that point, will inquire about the $40 coupon they are advertising online. For $900.01 a week, they will almost surely apply it, especially when it's on their homepage.